RNA extraction and isolation is a precursor for many methods in molecular biology including Northern Blotting, RT-PCR, and Microarray analysis. 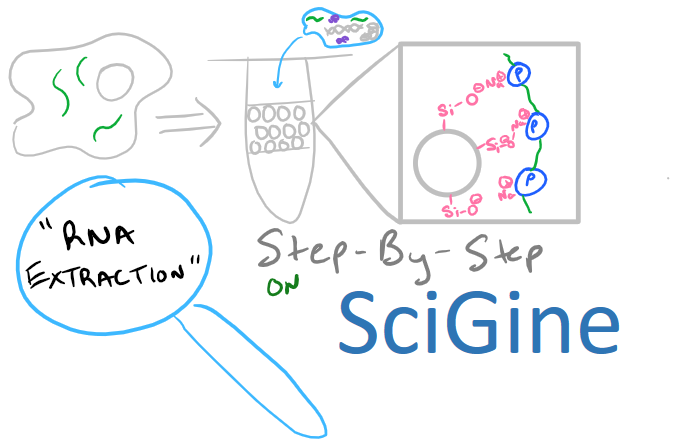 This blog post will focus on this precursor method as opposed to other biology techniques on the Scigine blog where I’ve focused on direct analytical techniques. 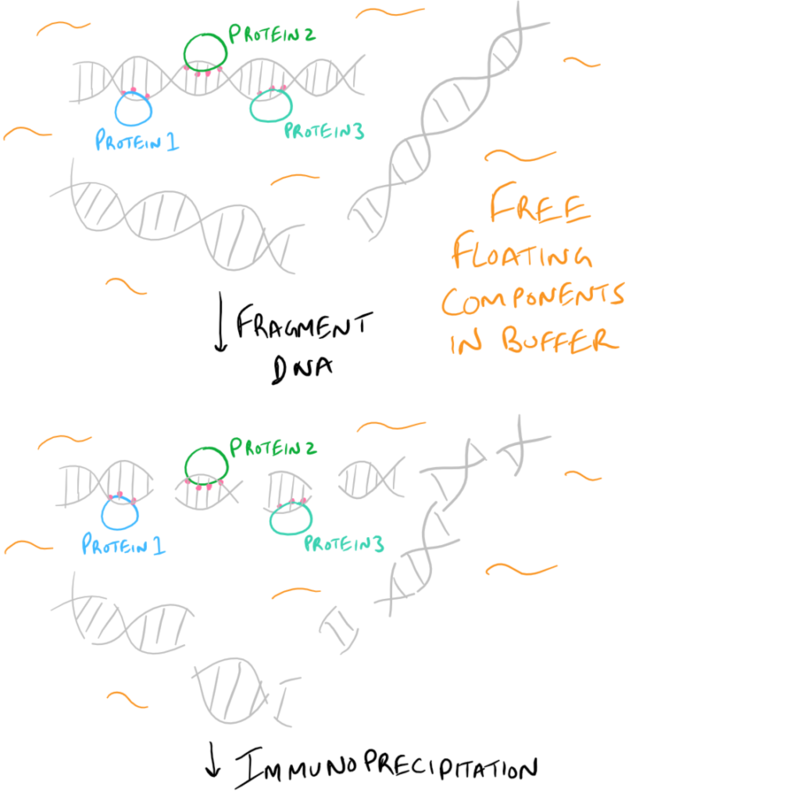 Nonetheless, there is a lot to learn about RNA isolation and plenty of theory that might be applicable in your research. While everyone knows DNA is double stranded and helical, few people know that RNA is typically a single stranded polymer. However, secondary structures do emerge within RNA due to complementary base pairing and structures such as tRNA can be double stranded. Also, due to secondary structures, flexible regions of RNA can actually catalyze the cleavage of phosphodiester linkages in nearby RNA chains. The RNA polymer has several ionic groups, inter-chain hydrogen bonds, and it is extremely hydrophilic. All of these forces need to be overcome in order to purify RNA from DNA, carbohydrates, and lipids which have similar structures and physical properties. Polymers of RNA can be short or long, but generally smaller strands that are less than 100 nu cleotide bases are hard to purify because they don’t separate well. Additionally, there are several RNAses present in cells and tissues that can catalyze cleavage of RNA chains, so extreme care needs to be taken to prevent degradation of RNA during RNA isolation and purification procedures. Typically RNA Extraction procedures start with cell lysis. A buffer that includes Guanidine Thiocyanate or other chaotropes is necessary to mask charges on RNA and water so that the polymer can be purified using solid-phase techniques. Chaotropes linearize the RNA polymer, disrupt hydrogen bonding and destroy the activity of any RNAses present in the cell lysate. 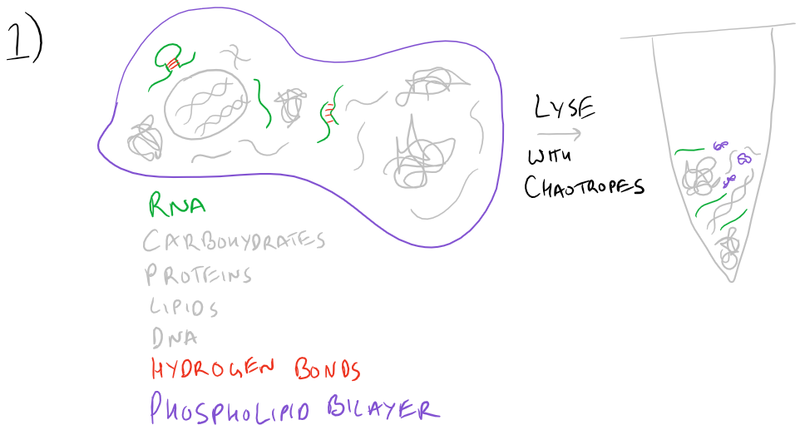 Due to their ability to disrupt hydrogen bonding, they also lyse cells by disbanding the phospholipid bilayer. To facilitate homogenization, a homogenization column (imaged below) may be used. By passing at high speeds through resins, viscous polymers such as DNA and lipids can be separated and the cell lysate will flow more easily. Ethanol is then added to: reduce the overall water concentration in the sample and precipitate proteins. As you would expect, RNA is highly soluble in water. A spin column (solid-phase support, imaged below) is then used to bind the RNA from the cell lysate. Initially a low chaotrope concentration wash buffer is used to clean the RNA sample and remove proteins while RNA remains attached to the column. Next, an ethanol wash removes some of the chaotropic salts that were left over from previous washes. Here’s a technique for RNA Isolation and cDNA preparation from Pancreatic Islets. We can use this technique for analysis of gene expression later on. Our strategy is to use solid-phase extraction of nucleic acids from complex cell lysate samples and then we can prepare the cDNA to examine the expression of genes such as insulin. Collect up to 100 islets in an Eppendorf tube and add 350 µl RLT buffer* to disrupt cells. Vortex thoroughly and add to QIAShredder column with collection tube attached. Spin for 2 min at full speed in microcentrifuge to homogenize the sample. Add 350 µl 70% ethanol to the lysate and pipette repeatedly to mix. Transfer to an RNeasy spin column and spin at ≥8000xg for 15 secs to bind the RNA to the column. Discard the flow-through. Wash the column with 700 µl RW1 buffer and spin at ≥8000xg for 15 secs. Discard the flow-through. Wash the column with 500 µl RPE buffer* and spin at ≥8000xg for 15 secs. Discard the flow-through. Repeat column wash with 500 µl RPE buffer and spin at ≥8000xg for 2 min. Discard the flow-through. To elute the bound RNA, transfer column into a fresh Eppendorf tube and add 30 µl RNase-free water to membrane. Spin at ≥8000xg for 1 min. Add RNase-free water to take reaction volume to 40 µl. Incubate at 37oC for 60 min. 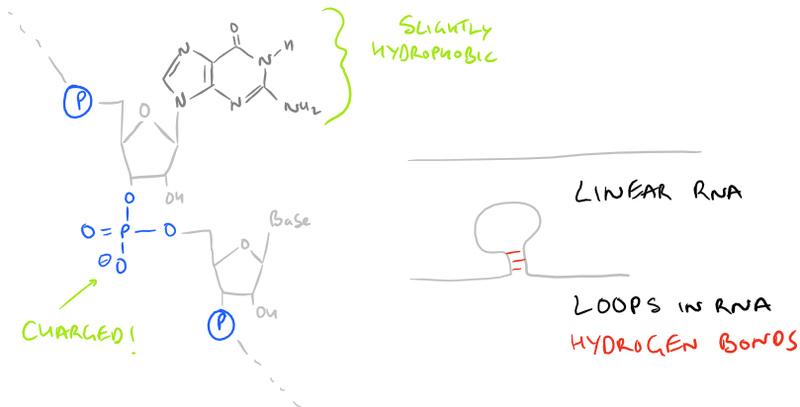 Place reactions on ice and use up to 1 µl per 10 µl PCR reaction*. Step 1. On the day of RNA preparation, add 10 µl of 14.3 M 2-mercaptoethanol per 1ml RLT buffer prior to use. This helps disable RNAses. [Check the] integrity of … [your] … RNA … – that is whether or not its degraded – before …[you]…continue with downstream applications…You need to know the quality of RNA to choose your primer for cDNA synthesis, and if you want to continue with real-time qPCR you need to have a certain minimum level when it comes to the quality of your RNA, if you want to be sure that you can trust the following qPCR results. If you want to perform microchip analysis the demand to quality is even higher comparer to qPCR. Sambrook, J., and Russell, D. W. (2001) Molecular Cloning: A Laboratory Manual. 3rd Ed. Cold Spring Harbor Laboratory Press, Cold Spring Harbor, NY. Immunofluorescence Microscopy (IF) is a classical technique to observe the localization of molecules in cell/tissue sections. While most researchers try to look for proteins, it is also possible to look for DNA, RNA, and carbohydrates in sections of tissue. With the addition of this technique to your tool belt along with the immunoprecipitation scientific method and the western blot scientific method, you will now have a variety of different ways of manipulating and analyzing biomolecules from tissues, cells, and cell lysates. The principle is fairly straight forward: incubate your sample with an antibody generated towards your target molecule and then detect the antibody using fluorescence. 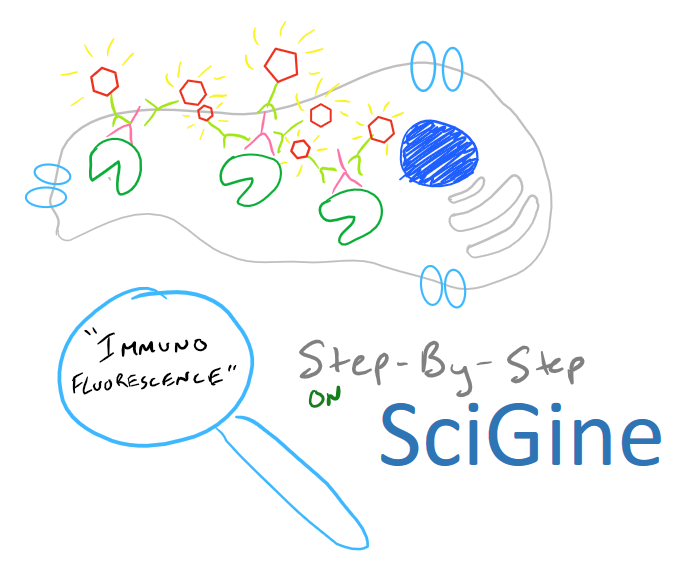 In an immunofluorescence microscopy experiment, this takes the form of putting your cells on a microscope slide, probing with antibodies, and then using specialized fluorescence microscopes with red/blue/green filters along with specific laser emitters to visualize the antibodies. As you would expect, you could either incubate your samples with a antibody-fluorophore conjugate and visualize it (direct immunofluorescence), or you could first put in an antibody that recognizes your target and then put in a secondary antibody-fluorophore conjugate that recognizes the first antibody (indirect immunofluorescence). 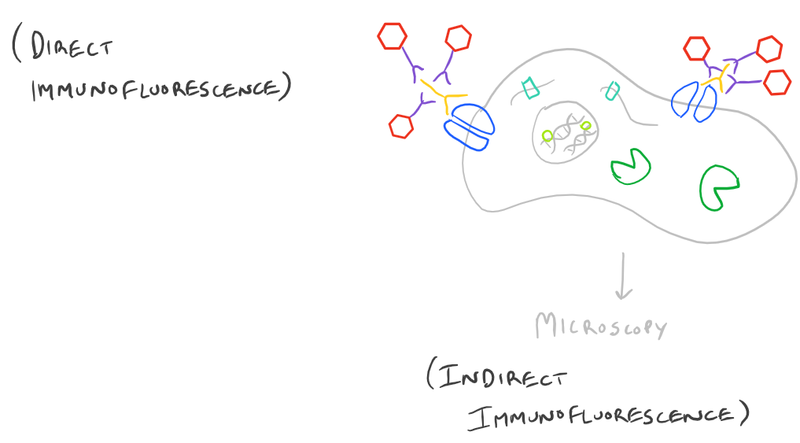 The most common method of performing an IF experiment is to use the indirect immunofluorescence technique. But both methods have their merits, and depending on your application, you may be limited to one method over another. Fewer steps: You don’t need to use a secondary antibody, so you have fewer wash and other steps. Fewer Complications: Fewer steps also means less troubleshooting. More expensive: Primary antibodies that are specific and also conjugated to fluorophores are hard to find and expensive. Lower overall signal: Each primary antibody only has one fluorophore, so you have lower overall signal. Higher signal: A single primary antibody may bind to multiple secondary antibodies (which each have a fluorophore)–so you get higher overall signal because of this amplification effect. 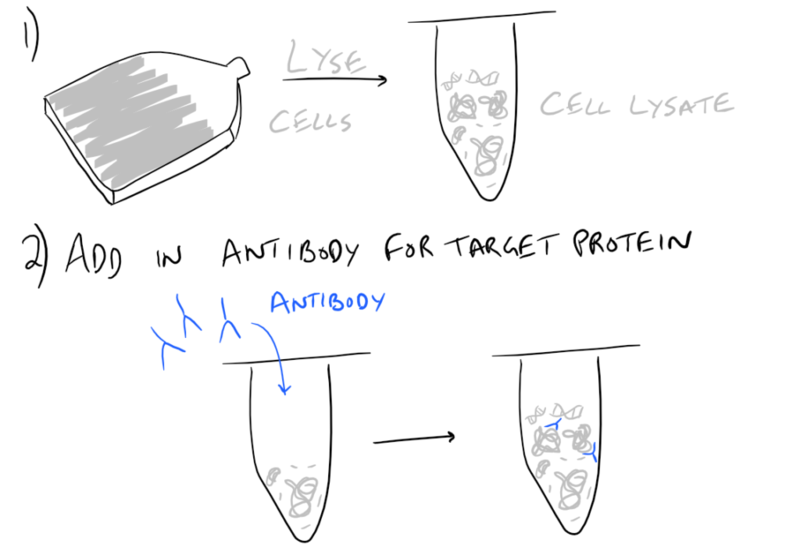 More versatile: Multiple types of secondary antibodies may be used to detect a single primary antibody. This allows you to probe the same sample multiple times, get higher signal, use a single secondary to detect multiple primaries, and various other strategies. Cheaper: Secondary antibodies raised against a certain species of primary are very cheap and widely available. More steps: With a secondary antibody incubation step, there is a possibility for more complications and troubleshooting. This leads to some challenges when performing IF experiments: photobleaching, autofluorescence, and non-specific fluorescence. 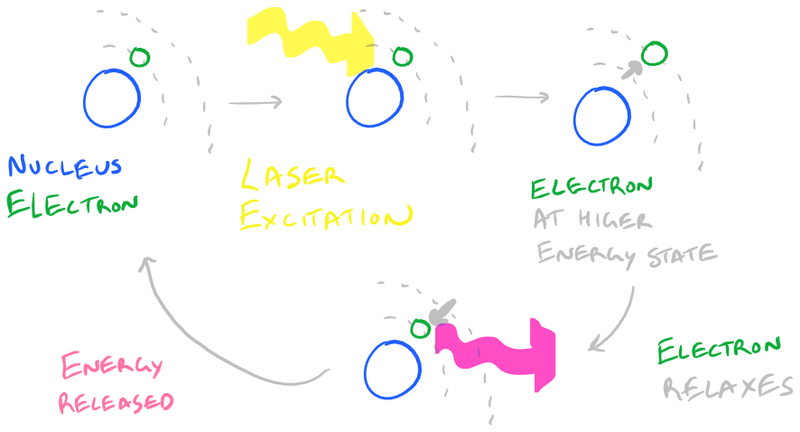 Use less energy: Some fluorophores will decompose after receiving a lot of energy from lasers. This is typically seen in microscopy when your sample slowly become dimmer and dimmer after imaging a section too long. To overcome this challenge you should use a lower energy intensity when looking around for the right locations in your sample, and then switch to a higher energy intensity when taking an image of your sample. Typically, good microscopy systems will take care of this automatically. Antifade agents: these molecules scavenge singlet oxygen radicals that are caused by high energy lasers and can be used to maintain high fluorescence signals during microscopy. It is theorized that singlet oxygen species are the main culprit that cause localized damage to fluorophores. High yield fluorophores: With fewer high-yield fluorophores you can get more signal. The “quantum yield” is an important number when considering which fluorophore you should use alongside your antibodies. If you can find quantum-dot conjugated antibodies, you’re going to be amazed with your microscope images! 🙂 I’ll write more about them in the future. 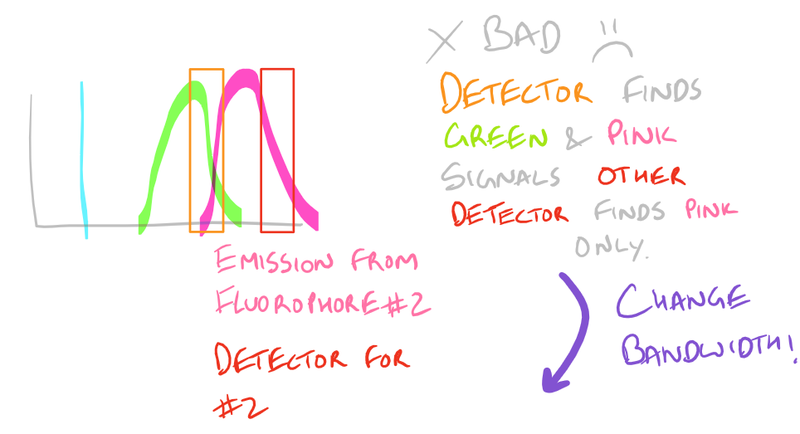 To avoid autofluorescence, use fluorophores with excitations and emissions far away from the above wavelengths so that the inherent fluorescence in your sample doesn’t affect your measured signal. 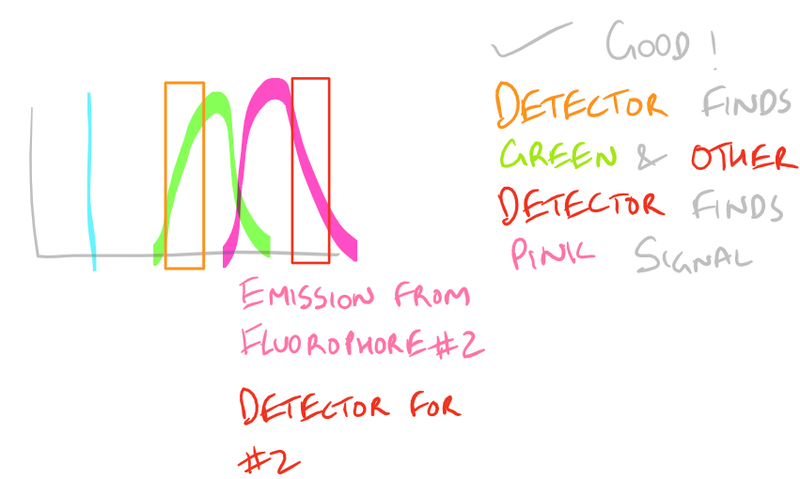 Based on the excitation and emission of different fluorophores it is possible for you to get fluorescence signals even though you haven’t probed for them. Be wary of the different fluorophores that you use in your sample and the bandwidths with which you detect them. You may need to modify your microscope’s settings and filters to get really sharp and beautiful IF images. To avoid non-specific fluorescence, consult a fluorophore chart as mentioned in the guide for the Flow Cytometry (FACS) scientific method. This protocol describes the detection of insulin in paraffin wax-embedded sections of pancreatic tissue. Cut 8 µm paraffin sections at the microtome and mount onto glass slides. Heat slides at 60°C for at least 5 min to melt wax. Dewax slides in xylene for 2x 5min*, 100% ethanol for 2x 5min and immerse in running deionised water until clear. Circle sections using a wax stick to easily observe staining area in subsequent steps. Prepare Proteinase K by adding 1 µl to 1 ml warm (37°C) Proteinase K buffer. Perform antigen retrieval by adding 50 µl of diluted Proteinase K per section in a humidity chamber for 20 min at 37°C*. Wash slides 3x 5 min in PBS with stirring. Block sections with 50 µl of 10% normal donkey serum in PBS at room temperature for 30 min in humidity chamber. Tip off blocking solution and add 50 µl anti-insulin primary antibody diluted in 10% normal donkey serum in PBS. Incubate overnight at room temperature in humidity chamber. Wash slides 3x 5 min in PBS with stirring. Add 50 µl anti-guinea pig biotinylated secondary antibody diluted in 10% normal donkey serum in PBS. Incubate 2 h at room temperature in humidity chamber. Wash slides 3x 5 min in PBS with stirring. Add 50 µl DAPI (3 µM) diluted in 10% normal donkey serum in PBS to stain cell nuclei. Incubate 30 min at room temperature in humidity chamber. Tip off excess solution from slide and mount in one drop of mounting medium with coverslip. Examine at the fluorescence microscope*. Consider buying “pre-adsorbed” secondary antibodies. These antibodies have been incubated with common cross-reacting species and they didn’t bind. Therefore, they are super specific to your species of choice and should provide very little background signal. Discussion of Immunofluorescence by Robinson et al. Immunoprecipitation is a method for extracting protein from a solution. Typically, this solution is a cell lysate which you want to analyze. Very frequently you’ll hear your colleagues say, «I’m going to do an IP-pull down on my protein» — when you hear this, you’ll know they’re talking about immunoprecipitation. This technique is a must-have for any biochemist who works with proteins because it’s so versatile. 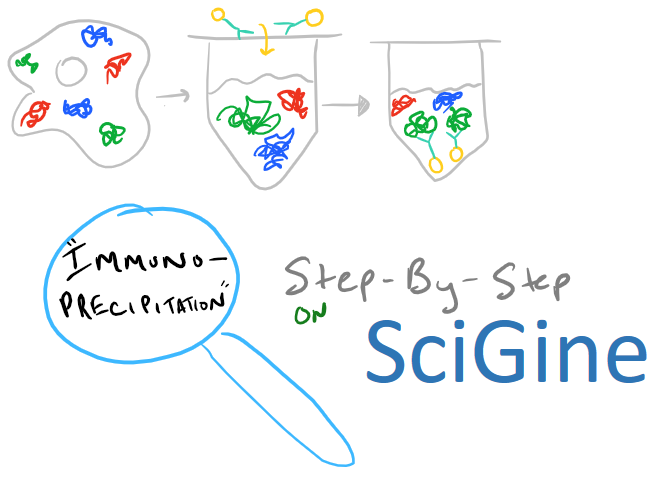 Once you remove a protein from solution, you can analyze it to see what it binds. You can also check out its molecular weight and structure. And, beyond proteins, IP can be applied to RNA and DNA pull downs as well. In theory, this method is very simple. 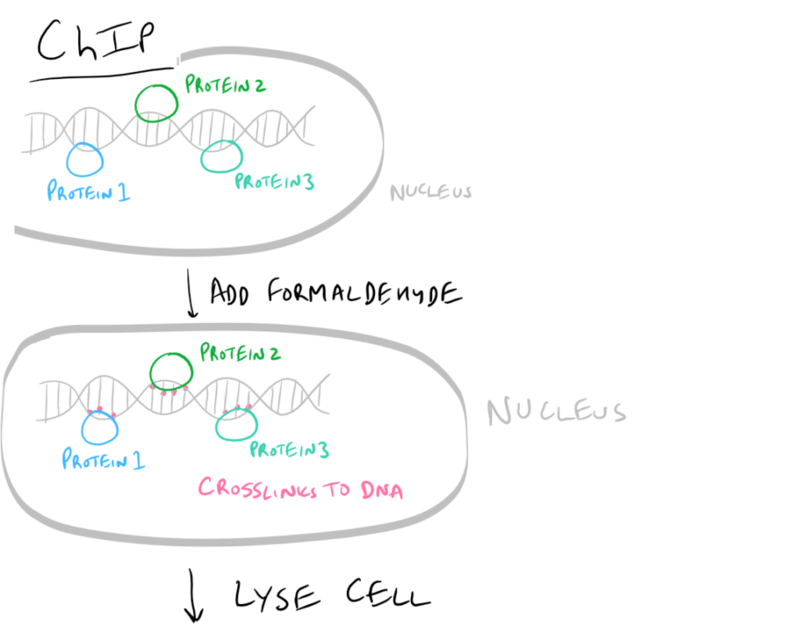 First, lyse your cells using some sort of lysis buffer. 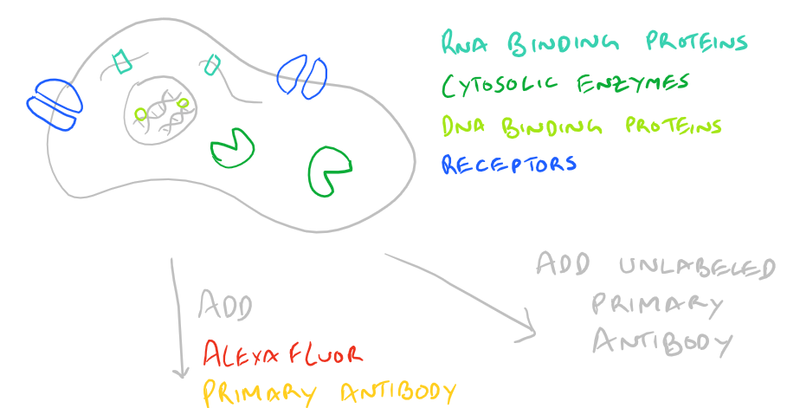 Next, add in an antibody that will bind your protein of interest and form a protein-antibody complex. Then drop in some resin which can bind the antibody. Typically, this resin is either agarose-based or superparamagnetic and is covered with Protein A and/or Protein G. These proteins are specifically designed to bind the heavy chains of antibodies so they can easily pull out your protein-antibody complexes. Agarose beads offer higher capacity per bead but magnetic beads are MUCH easier to separate because you can use a magnet to keep them in place. Finally, spin everything down and remove the supernatant. With the remaining bead-antibody-protein conjugates, you can either denature everything and run a SDS-PAGE western blot, or you can try to analyze your protein’s function with an activity assay, or run it on HPLC or LC-MS, etc. There are so many downstream applications of immunoprecipitation! 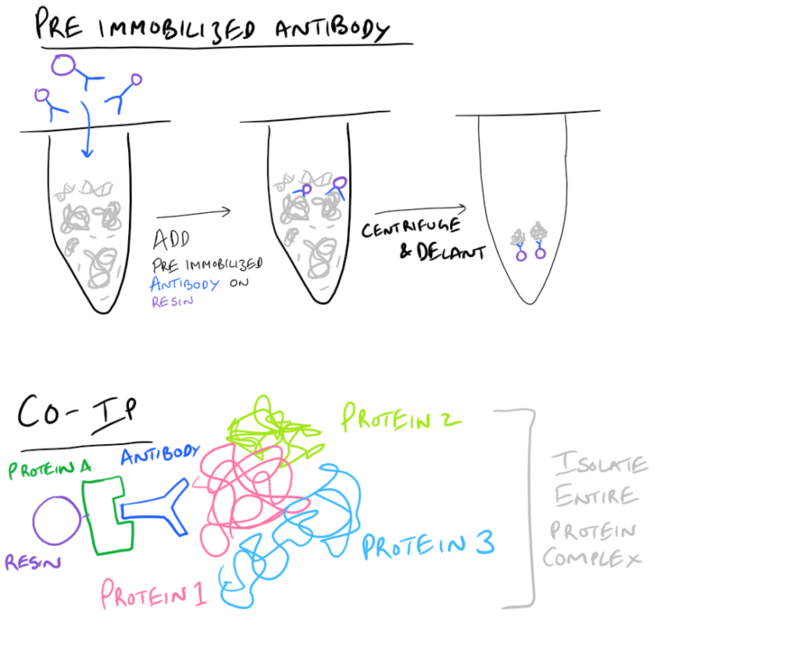 Pre-immobilized Antibody Immunoprecipitation: Instead of adding in antibody for your target and then immobilizing the antibody onto agarose beads, you can pre-immobilize it and then add it into your protein mixture. Co-IP, CoIP, or Co-Immunoprecipitation: In a Co-IP, you pull down multiple proteins along with your protein of interest as a complex. It’s very likely that this protein complex that is physiologically relevant to the signaling cascade that they trigger. As an example, you could pull out clathrin-binding proteins and you’d have a clue as to how these proteins enter/exit cells. Cool right? With this simple technique, you can now map out which proteins interact with each other to cause a certain phenotype! ChIP or Chromatin Immunoprecipitation: In this method, the DNA that is bound to your target protein is what you are after. The idea is to first let your protein bind DNA. Then you crosslink it using formaldehyde and lyse the cells. Next, you fragment the DNA so your protein isn’t bound to ALL the cellular DNA…it’s only bound to the DNA that it interacts with. Then do a regular IP based on this blog post. With this precipitated protein, you can then detach the protein from the DNA using heat and perform PCR to look at what DNA segment is being bound. RNA Immunoprecipitation or RIP: Jut like a ChIP, you can also pull out proteins that bind to RNA inside cells. 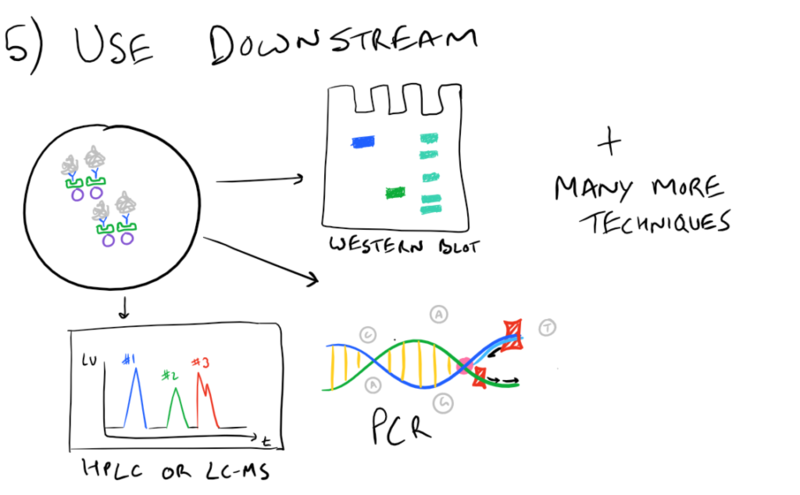 The strategy is the same as ChIP but you need to use RT-PCR to analyze the RNA that you get. We’ll discuss this technique in the future. Biotin/Streptavidin Immunoprecipitation: Some times, Protein A and/or G, based pull-downs don’t work because your antibody doesn’t bind to them very well (due to protein-to-protein variability). In these cases, you need an alternate strategy. If you can find biotinylated antibodies for your target protein, then you can use streptavidin beads to pull them out! Biotin-Streptavidin interactions are among the strongest molecular interactions known to science. 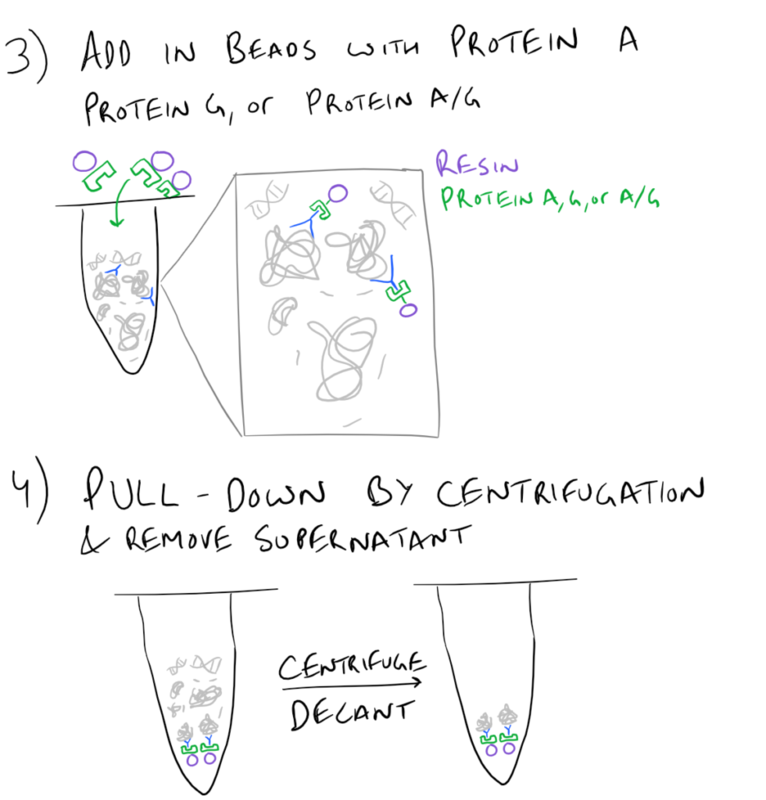 Covalent Capture Immunoprecipitation: If you cannot use Protein A and/or G, and you cannot find the biotinylated antibodies for your target protein, then you have to go back to chemistry. The strategy is relatively simple, but most biologists hate chemistry 🙂 All you need to do is to oxidize your antibody to introduce aldehydes in the backbone. This can be done using periodate oxidation on vicinal diols in the heavy-chains of the antibody. Then using amine-containing resins, you can capture the antibodies via schiff base formation and borohydride reduction. You can also flip this strategy on it’s head and use amine-containing antibodies with aldehyde containing resin. Immunoprecipitation of the Lck protein from T cell lysates has been used to analyse the phosphorylation patterns of this important T cell activation protein. Perform all steps on ice to avoid protein degradation. Pellet cell debris for 15 min at maximum speed on microcentrifuge at 4°C. Preclear lysate by adding 50 µl of washed Protein G-Sepharose beads at 4°C with mixing for 1 h. Pellet beads for 20 sec at maximum speed on microcentrifuge and retain lysate in a fresh tube. Add 1-2 µg of specific antibody (eg. anti-Lck) to lysate for 15 min at room temperature. Add 50 µl of washed Protein G-Sepharose beads and incubate overnight at 4°C with mixing. Step 1. Prepare fresh lysis buffer on day of procedure. If protein is intended to be assayed for phosphorylation levels, also include phosphatase inhibitors. Step 3. Protein G has a high affinity for mouse Ig; for other precipitating antibodies Protein A can be used. Step 6. If samples are to be analysed by SDS-PAGE, add reducing sample buffer directly to washed immunoprecipitates prior to electrophoresis. Protein A and/or G are not great way to immobilize antibodies if doing an IP with serum. Serum contains lots of other Protein A and/or G types which will compete with your IP resin.